Have you ever wondered what NLP is? 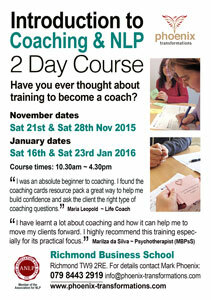 Do you want to find out more about NLP? Why would you want to use NLP and how can NLP be used? NLP (Neuro Linguistic Programming) is a set of skills, tools and principles that when learnt and applied, can help to create more awareness in ourselves and others enabling us to create ‘better’ choices, expand beyond our existing conditioning, be in charge of our actions and create more empowering results in our lives. Attending training with Phoenix Transformations can help you to become a 'mechanic' of your mind or to others you may even seem to be a 'Magician' of the mind! All things become possible when you know where to 'tap'! Phoenix Transformations is about helping you to get results! Whether you’re a total beginner to NLP, whether you want to refresh existing skills or have recently become NLP- certified, there’s something for you. Click the link below to get regular updates on information, news and resources on my NLP practice sessions & training courses and find out how they can help you to develop & grow both in your personal & your professional life! Watch out for the 2 Day NLP coaching course in Jan 2016. You can register for trainings here.